Commander of Fort Sumter during the engagement that started the American Civil War, Robert Anderson also served as commander of the Department of the Cumberland in 1861. Robert Anderson was born on June 14, 1805 on his family’s plantation, “Soldier’s Retreat,” near Louisville, Kentucky. He was the son of Richard and Sarah (Marshall) Anderson. Anderson’s heritage was steeped in political and military prominence. His father was a slaveholder who served as an officer in the American Revolution and was a charter member of the Society of the Cincinnati, an organization founded to preserve the ideals and fellowship of the officers of the Continental Army. Anderson’s mother was a first cousin of Chief Justice John Marshall. Anderson’s brother, Charles Anderson, served as Governor of Ohio from 1865 to 1866. Little is known about Anderson’s early life prior to his appointment to the United States Military Academy in 1820. Anderson entered the Academy on July 1, 1820 and graduated five years later on July 1, 1825, fifteenth in his class of thirty-seven cadets. Following his graduation Anderson was brevetted as a second lieutenant with the 2nd U.S. Artillery on July 1, 1825 and then promoted to the full rank of second lieutenant with the 3rd U.S. Artillery on the same day. He left the army from October 1825 to July 1826 to assist his brother Richard, who was commissioned as Envoy Extraordinary and Minister Plenipotentiary to the Panama Congress of Nations. Upon his return to the army, Anderson was assigned to various artillery posts. In 1832, he campaigned as a colonel of Illinois volunteers against the Sac Indians during the Black Hawk War (May–August 1832). One year later, Anderson was promoted to first lieutenant with the 3rd Artillery on June 30, 1833 and returned to garrison duty. On September 10, 1835, Anderson was appointed as an assistant instructor of artillery at the United States Military Academy. He held that role until December 1, when he was elevated to the position of instructor. Anderson remained at West Point until November 6, 1837, when he was transferred to Florida to campaign against the Seminole Indians for two years. During the Second Seminole War (1835-1842), Anderson was brevetted to captain on April 2, 1838 “for Gallantry and Successful Conduct in the War against the Florida Indians.” During his time in Florida, Anderson contracted fevers from which he would suffer recurrently for the rest of his life. From May 9 to July 7, 1838, Anderson served as Major General Winfield Scott’s aide-de-camp. On July 7, 1838, he was again brevetted to captain and assigned as Adjutant-General of Eastern Department, serving in that capacity until November 30, 1841. On October 23, 1841, Anderson was promoted to the rank of captain with the 3rd Artillery and returned to garrison duty. On March 26, 1842, Anderson married Elizabeth Bayard “Ezra” Clinch in New York City. The bride, who was the daughter of a Georgia plantation owner, Duncan Lamont Clinch, was given in marriage by Major General Winfield Scott. The marriage produced five children. Reportedly, through his wife’s inheritance, Anderson briefly owned slaves when his father-in law passed away in 1849. Anderson’s wounds ended his time in Mexico, and he was on disability until 1848, when he returned to active service on garrison duty at Ft. Preble, Maine. Anderson spent the next decade serving as an instructor or representing the army on numerous commissions or boards. 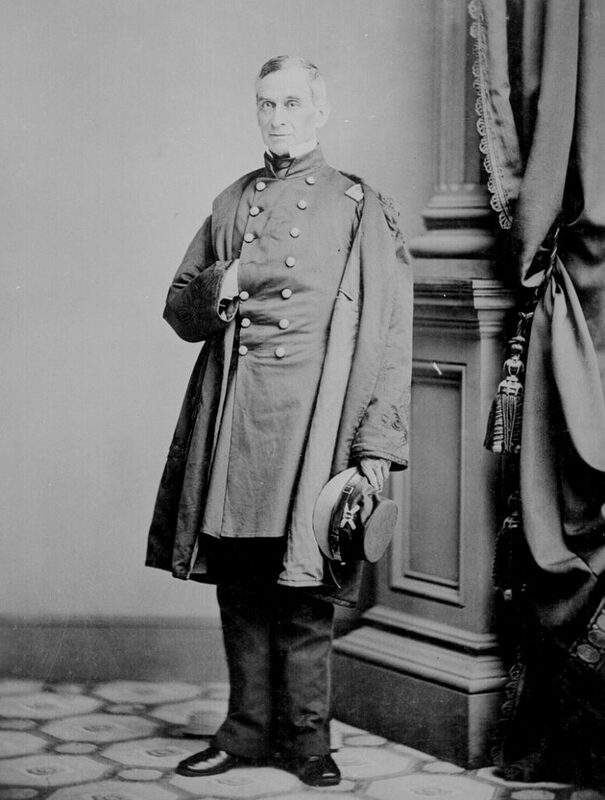 On October 5, 1857, the army promoted Anderson to the rank of major with the 1st U.S. Artillery. The election of Abraham Lincoln to the U.S. presidency on November 6, 1860 deeply intensified the sectional division that was plaguing the nation. As talk of secession escalated, federal property in the South, especially military armories and forts, became potential flashpoints. One smoldering hot spot was Charleston Harbor, South Carolina, where the federal government owned four facilities (Fort Moultrie, Fort Sumter, Fort Johnson, and Castle Pinckney). On November 15, 1860, Secretary of War (and future Confederate general) John B. Floyd ordered Anderson to relieve John Gardner as commander of the federal garrison at Fort Moultrie. If Floyd appointed Anderson because he expected the major’s alleged pro-Southern sympathies to impact his performance as a U.S. Army officer, he was quickly disappointed. As early as December 11, the War Department instructed Major Anderson that “… you are to hold possession of the forts in this harbor, and if attacked you are to defend yourself to the last extremity.” Anderson soon decided that his position at Fort Moultrie was indefensible against a land attack by the South Carolina Militia. During the night of December 26, 1860, he and his command abandoned Fort Moultrie, spiking the guns before they left. Under cover of darkness, Anderson consolidated his command at the more formidable Fort Sumter. An outraged South Carolina Governor, Francis Pickens, ordered the South Carolina Militia to occupy the vacant Castle Pinckney and Fort Moultrie and demanded that Anderson abandon Fort Sumter. When Anderson refused, the governor resolved to besiege the Federals. On February 15, 1861, the Provisional Confederate Congress authorized President Jefferson Davis to occupy Fort Sumter by force if necessary. Davis dispatched Brigadier-General P. G. T. Beauregard, on March 3, to assume control of military affairs at Charleston. Two days later, newly inaugurated President Lincoln was shown a message from Anderson, estimating that the garrison at Fort Sumter had only enough provisions to last through April 15. Refusing to acknowledge the legitimacy of the Confederacy, Lincoln informed Pickens, on April 6, that he intended to resupply the beleaguered garrison at Fort Sumter. The president went on to assure Pickens that the federal government would not use force or attempt to enlarge the garrison at Fort Sumter unless the effort to resupply the fort met with armed resistance. On April 10, the Confederacy reacted by authorizing Beauregard to fire on any attempt to re-provision the fort. On April 11, emissaries from Beauregard delivered a message to Anderson, demanding surrender of Fort Sumter. Anderson refused. Just after midnight on April 12, Beauregard dispatched another negotiating party to the fort. This time Anderson agreed to evacuate the facility by April 15, if his garrison was not resupplied before then. Unwilling to accept Anderson’s proviso regarding supplies, Beauregard’s envoys ended negotiations at 3:20 a.m. and informed the major that Confederate batteries would begin shelling Fort Sumter in one hour. At 4:30 a.m., April 12, 1861, the South Carolina Artillery fired a mortar shot over Fort Sumter, signaling the commencement of the bombardment of Fort Sumter. The American Civil War had begun. Over the next thirty-four hours, the Confederates fired more than three thousand shells at the fort. By the afternoon of April 13, the combination of bombing, blazes, and a shortage of provisions had rendered the garrison helpless, so Anderson informed Beauregard that he was willing to evacuate the fort. Beauregard’s terms were generous. He detained none of Anderson’s men as prisoners, and when the Federals marched out of Fort Sumter on Sunday, April 14, 1861, Anderson carried with him the American flag that had flown over the facility. Although Anderson considered his inability to hold Fort Sumter as a failure, he was soon surprised to learn that he had become a national hero. On April 19, 1861, Anderson and his men were regaled by over 100,000 people at a rally in Manhattan. Union officials quickly sent Anderson, along with the American flag that he had rescued from the fort, on a tour across the North, raising support, funding, and military recruits for the Union cause. In recognition of Anderson’s service to his country, President Lincoln promoted Anderson to the rank of brigadier-general in the regular army effective May 15, 1861. On May 28, the War Department ordered Anderson to take command of the newly created Department of Kentucky, which included as much of the state of Kentucky that lay within one hundred miles of the Ohio River. On August 15, 1861, the War Department issued General Orders No. 57, which effectively replaced the Department of Kentucky with an expanded department that included all of Kentucky and Tennessee. The newly created unit was named Department of the Cumberland. Soon thereafter, Anderson became ill, possibly due to the fevers he contracted while serving in Florida or the injury he sustained during the Mexican-American War. On October 7, the War Department issued General Orders No. 6, directing Major General William T. Sherman to relieve Anderson. With his health shattered, Anderson spent the next two years in New York awaiting orders. He was finally given a brief command of Fort Adams, at Newport Harbor, Rhode Island, from August 19 to October 27, 1863, when he was retired from active service “for Disability resulting from Long and Faithful Service, and Wounds and Disease contracted in the Line of Duty.” Although not on active duty, Anderson continued to serve in a nominal position at New York City, on the Staff of the General commanding the Eastern Department until January 22, 1869. On February 3, 1865, he was brevetted to major general “for gallant and meritorious service in the harbor of Charleston, S. C., in the defense of Fort Sumter.” Two months later, on April 14, 1865, Anderson returned to Fort Sumter to raise ceremoniously the Stars and Stripes over the stronghold that he had been forced to evacuate earlier (four years to the day). In 1870, Anderson traveled to southern France, hoping that the mild climate might restore his broken health. The change in climate provided no relief, however, and Anderson died in Nice, France, on October 26, 1871. His remains were returned to the United States, and Anderson was buried with full military honors at the United States Military Academy Post Cemetery, West Point, New York.